After I started digging for the root cause as to what is exactly triggering the bug. 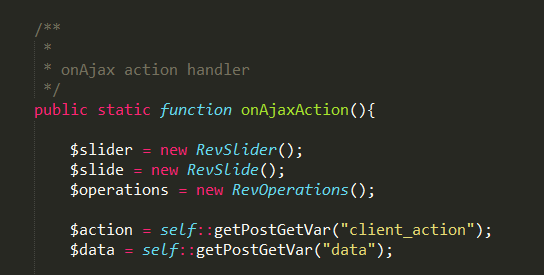 I figured that there is a class file called as revslider_admin.php in the Revslider Plugin folder, where you can find onAjaxAction() function which is actually triggering bug. There is switch call where it is calling another function called as updateCaptionsContentData() as shown in the bellow image . The updateCaptionsContentData() function is located into inc_php/revslider_operations.class.php , where is the actual cause of bug as you can see writeFile function which is writing content in the file. You can patch this bug by installing Latest version of Revslide builder.